It snowed on Friday! And while Tokyo doesn't get the awesome piles of white stuff that many other parts of Japan (and the rest of the world) receive, I always enjoy seeing everything blanketed in white. I hiked the Nakasendo trail on my last vacation, and there was plenty of snow out there, but I can always go for more. I took this picture just as the snow turned to rain, so as you might imagine it didn't last long. But February is when the real snow came last year, so I have high hopes. 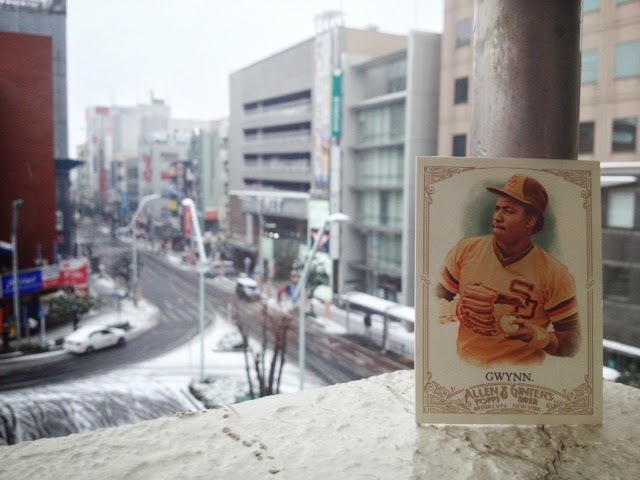 The first year I was in Japan the first snow, similar to this, also came the last week of January. How's Tony doing? He's actually in great shape. There's a small nick on a border from taking him out a few times, and the corners aren't crisp. There's a little bit of bending on one corner, but since my wallet doesn't get too rough and the pocket I put him in seems to be pretty well-built, the card is staying strong. I wanted to prop the card up in snow on the ledge, but there was no such luck. BBM has been quietly releasing sets in its "Legends" series now for quite some time. Each set contains a large number of retired players, generally focusing on a team's dynastic era. In the thirteen season span of 1982-1994, the Lions were the Pacific League's most powerful team. This set focuses on that era. 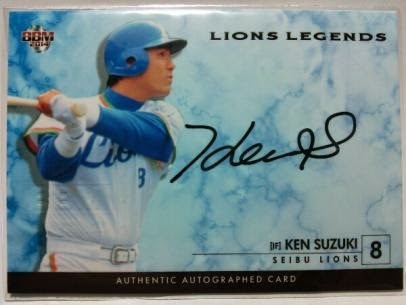 As NPB Card Guy mentioned, the Lions won 11 PL pennants and the Nippon Series eight times. I'd say that's pretty successful! This is the fourth (of five so far) in the series, and was released in late November. The base card design is the same as the other Legends sets. The light blue marble border/background is elegant but not distracting and the photo area is pretty large. The backs feature the usual biographical data, along with statistics for the player while he was with the team and his career; the write-up focuses on their contributions to the team during the era. Cards are numbered in the top right. The cards do have a black border at the bottom which my scanner can't pick up; on the back this contains the copyright information. 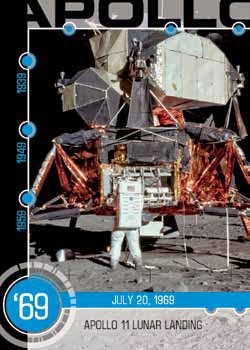 A full set has 81 cards; there are no subsets in this issue. Two 27-card partial parallels of the base set were issued; gold foil signatures are numbered to 100, while a blue foil parallel is numbered to the player's jersey number (from 1 to 47 copies per). The lone insert in this issue is 80's Best Nine, with nine cards. There is a parallel, serial numbered to 100 copies each, The parallel uses gold foil where the "80's Best Nine" text is. There's a single autograph set with cards randomly inserted in the packs. There are 31 different cards, most with print runs around 100 copies each. This checklist is not the same as the foil signature set. I like the look of the Legends sets, and like the Achievement sets it's a good series to continue. I don't know what exactly draws me to Yuko Ogura. Perhaps it's her playful nature. And I really don't know when I first learned about her. 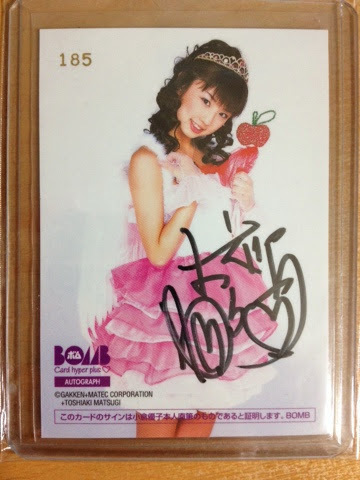 Now 31 and married with a child, she also has an alternate personality of sorts, Princess Apple-Momoka; one of her many trading card sets is her as Princess Momoka. She's also a singer, performing the ending song for the Japanese anime School Rumble. She's still adorable today and makes occasional appearances on TV and at events, and has written a book about being a mother. I love this card, and is immediately my favorite idol card in my collection! I picked up a bunch of limited cards recently, and I thought I'd share a few! This is a hard-signed card from a 2009 Golden Eagles team issue set. I'm not sure if it's an IP or was part of the original issue, as very little information seems to exist on the Golden Eagles team sets. One of these days I'll spend a bit of time researching it, but for now this card remains a bit of a mystery. 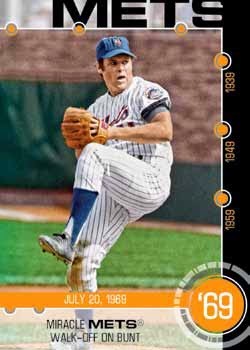 "Photo Cards" continue to bother me... aren't 99% of baseball cards in existence photo cards anyway? The draw here (besides the limited print run) is the framed image. I believe the image itself is an actual photograph that you would get from film. Perhaps NPB Card Guy or someone else knows more. Again, I could research it myself, but I'm lazy tonight. The back gets mini-sized on my blog because it's the same image. This is a foil-signed special card found in box sets honoring Kaneda. Lightning was an insert found in packs of 2011 BBM 1st Version, and this is the 100-copy parallel. The foil on the front is different here, and I think it's better this way. Also from 1st Version is this gold foil signature parallel (also #/100). And also a foil parallel is this "Printed Autographed Card" from the recent Hawks Achievement box set. I like the "stamp" design on the back of the card, and it's numbered out of 50. The last two cards are from the Lions team set BBM released last year. This is a parallel from the Lions Den insert set, which has gold foil lettering on the front and is numbered out of 100. 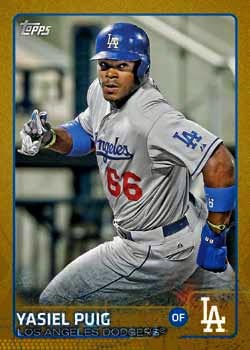 BBM cut back on parallels in team sets last year, but it did create serial-numbered parallels of many of the team set subsets, like Total Package. The fronts have a sort of cracked-ice refractor coating, and they're serial-numbered out of 150. It's amazing how many parallels I don't have cataloged yet. Many are from 2014, but I discover occasional parallels from the past decade too! Sports Graphic Number is a magazine found on newstands in Japan which, unsurprisingly, has lots of photos and stories about baseball and other sports stars. Over the past few years, they've issued a few single-player baseball sets for some of the best of the best active players. As far as I can remember, this is their first multi-player baseball set, though they only went with three. Note that the company itself sometimes is known as Athlete or Sports Athlete, and the official "publisher" is TICトレカ (TIC Trading Cards). As is customary with SGN, the base cards are photo-based. Some cards form puzzles, but other than the team logo and player name on the front, and card number and copyright line on the back, there is no text on the cards. The three players are Tetsuto Yamada (above), Shingo Kawabata, and Yuhei Takai (seen below). The regular set has 81 cards, distributed evenly among the three players. There are two designs to the SP cards, though they are numbered sequentially. The first design uses gold foil, #SP01-SP18. There are three images on the front in sequence, with a fourth image on the back in a gold frame. The background is of a cloudy late-afternoon sky. A similarly-themed background is found on the silver foil SP cards, numbered SP19-SP36. These only have two different photos; the back photos on these cards are in a silver frame. There are six box privilege cards, BP01-BP06 with two per player. A store-distribution card carries a unique design as well that puts all three players on the same card. I am aware of a card A and a card D, using different photos and arrangements of the players on the front. There is a series of promo cards for the set which were distributed in stores. These cards featured 10 different players who were eligible to be in the set; a voting campaign in September helped decide the three finalists. These cards were also distributed at the stadium on three dates to 2000 people each game. Above is an image of all the promo player cards you could get. I'm not sure about any print runs for any of the sets above. One special card is found per box of 10 packs. For the second year in the row, Frontier issued a Season Summary set. 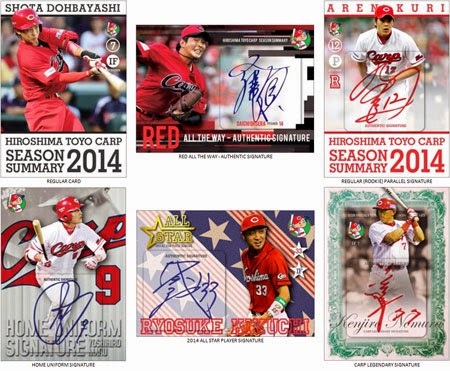 Last year, there were multiple teams with box sets, but this year it seems that only the Carp wanted one. The base card fronts have large white borders at the top and bottom with large black text. 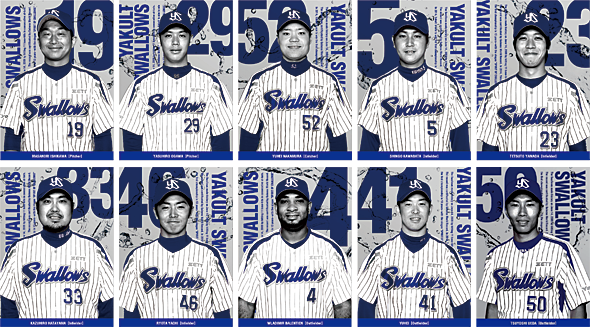 Additional small circles along one edge has the Carp team logo, player's jersey number, and position. The backs use use the same photo, though it looks like the background has been blurred (at least where another player - or umpire - is in the shot). Additionally, the photo has been cropped slightly differently to give more of the background. Basic biographical details and a season line of statistics are found at the bottom; cards are numbered in an upper corner. The design isn't bad, though a large portion of the front has text. If these cards were large-sized (A4 or 8x10, or poster size) the design would work that much better. It does feel like a form of an advertisement, almost. Boxes retailed for around $80 each. Everybody's posting final checklists for the first series of 2015 Topps baseball cards, and I've taken a gander or two at the multitude of inserts to be found. I figure that while everyone is looking at the checklists and thinking about what they want, I'll add in my two cents for a few of the sets. Maybe you'll keep me in mind as you bust packs next month! Let's start with the base cards. I'll get a full set at some point, but there is one card I'm anticipating more than any others: Buck Farmer, card number 193. I like the design with colored stone-style fading borders though, as it's a nice change from the plain white. 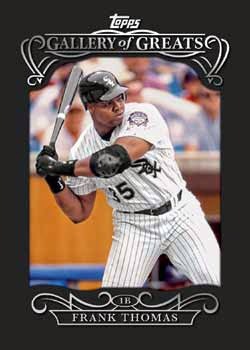 Buck (and the other 349 cards in the set) seem to have nine announced parallels (gold, rainbow foil, snow camo, black, pink, plates - which I count as a single parallel, platinum, framed, and clear). But of course there will be Target red, WalMart blue, ToysRUs purple, and probably a few other retail parallels like were issued last year. Keep me in mind if you pull Mr. Farmer from your Topps packs! The Highlight of the Year set has some promise. It depends on what the unsigned cards look like. With nine per hobby box and only 30 cards in the first series, it should be very reasonably obtained if I take the plunge. Many other inserts really don't pique my interest. Other than the throwback minis, there haven't been any stand-out sets in Topps' flagship set in the past few years. However, I am somewhat interested in Gallery of Greats. These will be paper-framed cards similar to Gypsy Queen, but with only two per hobby box and a 25-card checklist, I think I'm going to pass. There are a couple odd insert sets on my list, though. The Baseball/History insert set of 30 cards will have fifteen non-sport events paired with baseball events that happened on the same day. I have an interest in history and the linking of two facets of American culture is quite appealing. With four cards per box, I can probably get the full set without much travel. Speaking of culture, here's a set I've been asking for since arriving in Japan. BBM has issued a First Pitch subset in its second series each year for about a decade. The checklist is full of has-beens and never-weres for the most part, but I like the effort and I will definitely build this set as quickly as possible. The checklist has fifteen cards but I haven't seen any odds. Again, if you aren't interested in these, I have a great home for them here! 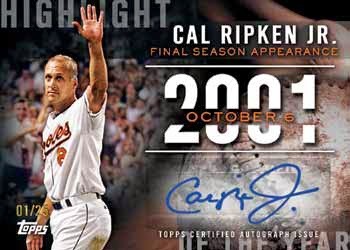 There are some insert sets that I have yet to see - Robbed, First Home Run, etc. And Cardboard Connection lists two other retail sets that I could chase if they're obtainable and attractive: The Babe Ruth Story, and The Jackie Robinson Story. 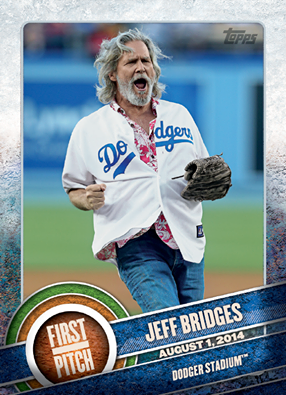 So, for the first time since 2011, I'm actually excited about flagship Topps! It's only two weeks away. What, if anything, are you going to collect from this year's release? Along with professional baseball in Japan, the Yomiuri Giants are celebrating their 80th anniversary. Yup, the Giants are recognized as the first professional team in Japan, and remain in existence after all these years. Not only are they the longest-running team, they are the most powerful. With plenty of money in the team's coffers, they really are the Yankees of the NPB, attracting the best players and frequently making it to the Japan Series. Their best years were in the 1960s and 1970s, when Oh and Nagashima led the team to multiple victories. This set recognizes that accomplishment. The base cards have a premium feel to them, with a high gloss finish and foil highlights. The blue stadium background doesn't really do much for me; I'd prefer seeing the original background. The fronts and backs contain the "V9 Glorious Victory" notation, and fronts list the years the player was with the team. Backs have statistics, awards, and other recognitions. Cards are numbered in the upper left corner on the back, and the set rounds out at 46 cards. 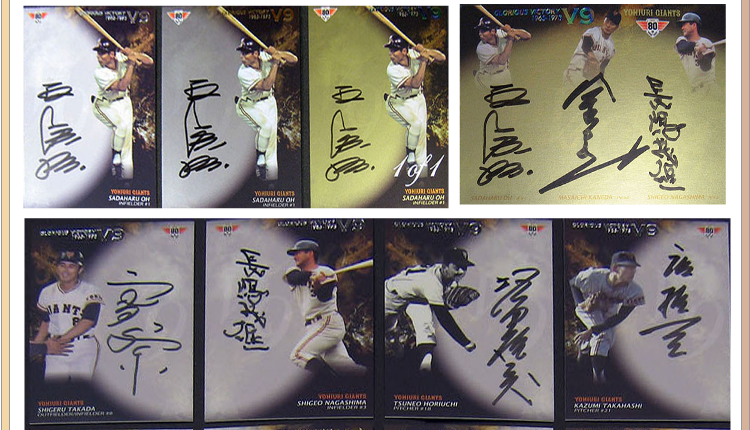 Each box contains one full 46-card set, one parallel, and two autographs. It looks like 44 players have autographs, while the other two have printed signatures. 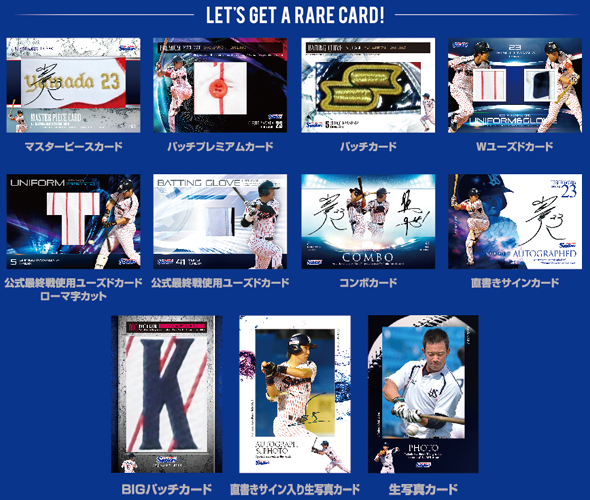 There are around 80-85 cards per player (Oh and Nagashima have a small handful each). 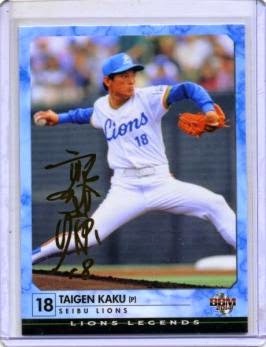 The autographs have a silver foil parallel, generally limited to around 25 copies (again, with Oh and Nagashima receiving a very small number). Additionally, the gold foil parallel are 1/1s. There is one triple autograph, of which there are three copies. In the top row of the image above, you can see Oh's regular, silver, and gold autographed cards, along with the triple-signed card. The bottom row has additional silver parallel autographs. One box had an original retail price of 9800 yen plus tax, though these are almost completely sold out! I can pick up a few base sets still, though. I might get one for myself this weekend, as the set continues to grow on me. I Got Majorly Zippy Zapped for New Years! Wallet Card Game: I'm in!